A Colombian paramilitary chief wanted in the US for alleged drug trafficking may not be handed over for extradition. Diego Murillo, also known as Don Berna, turned himself in last month after a three-day manhunt. The US wants him extradited, but a senior minister said any decision would rest with President Alvaro Uribe. Mr Murillo's role as a negotiator for the far right AUC group grants him effective immunity under Colombia's ongoing peace process. Colombia's interior and justice minister, Sabas Pretelt, said that all legal proceedings against Mr Murillo would be suspended as long as he remains in peace talks. Colombia's government is attempting to negotiate a settlement with right-wing paramilitary groups, who are blamed for a string of massacres throughout the country. Last month the AUC criticised Colombia's government for launching a manhunt for Mr Murillo, accusing President Uribe of undermining peace the peace process. Police sought Mr Murillo on suspicion of ordering the murders of three people, including a local politician. The US, which accuses Mr Murillo of conspiring to import thousands of kilogrammes of cocaine from Colombia, filed an extradition request with Bogotá on Thursday. 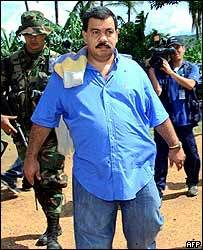 Mr Murillo is also suspected of having headed a team of assassins for the now defunct Medellin drugs cartel of former drug lord Pablo Escobar. Asked about the US extradition request by reporters, Mr Uribe said only that Colombia is "a country of laws". Mr Pretelt told reporters that all judicial orders against members of the AUC negotiation team have been suspended and any special request would be a matter for the president. The AUC says it is committed to demobilising all its fighters by the end of the year, but it has clashed with the government over possible punishments for serious human rights abuses.